We have successfully prepared anodized alumina membrane distributed Bragg reflector (DBR) using electrochemical anodization method. The transmission peak of this distributed Bragg reflector could be easily and effectively modulated to cover almost any wavelength range of the whole visible spectrum by adjusting anodization temperature. Distributed Bragg reflector (DBR) is a structure, which is consisted of periodically stacked multiple layers with different refractive indices in one dimension. As one-dimensional photonic crystal (PC), it can strongly and selectively modify the propagation of the incident light. According to this outstanding optical character, DBR has attracted much more attention in recent years due to its wide applications in light filters, vertical cavity surface emitting laser, electroabsorptive reflection modulators, etc. [1–7]. Recently, Wang et al. described a photonic crystal via making air pores periodically in anodic alumina membrane (AAM); however, the stop band of incident light is only modified from 450 to 525 nm by changing the chemical etching time. When the incidence angle increases progressively, a blue shift of the transmission peak emerges and the peak intensity reduces gradually . It has been reported that a novel kind of DBR at low cost, named AAM DBR, was prepared based on the layer-by-layer structure in AAM by adjusting the anodizing cell voltage periodically in the process of electrochemical anodization of Al foil, and the first Bragg condition peak in transmission spectra of this AAM DBR can be modulated from 727 to 1,200 nm . As known, the electrolyte temperature determines the velocity of oxidation and chemical dissolution, the surface porosity, as well as mechanical stress at the metal/oxide interface in the process of electrochemical anodization [11–13]. Nevertheless, there has been no investigation of the influence of temperature on the optical characteristics of AAM DBR up to now. 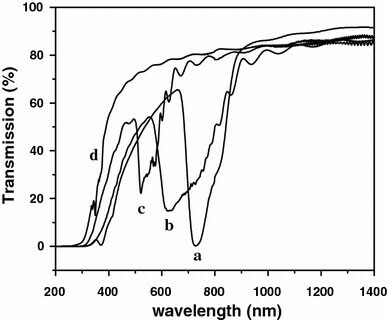 In this study, by varying the anodization temperature we could conveniently obtain the AAM DBR with the transmission peak covering almost any wavelength range of the visible light region. 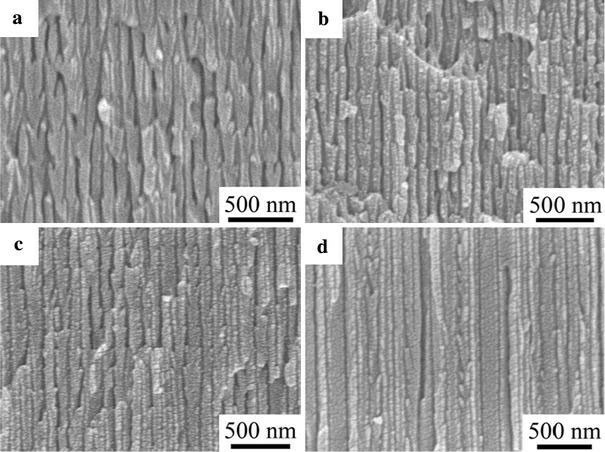 The variation of intensity of the transmission peak versus anodization temperature has also been investigated. For the synthesis of AAM DBR, high-purity aluminum foils (99.999%) were first degreased in acetone and ethanol, and then annealed at 500 °C under vacuum ambient (about 2 × 10−5 torr) for 5 h to remove the mechanical stress. The aluminum was electrochemically polished by a mixture of HClO4 and C2H5OH (the volume ratio is 1:9). In the process of electrochemical anodization, we made use of a computer to output a periodical cell voltage. In one period, the cell voltage increases sinusoidally from 23 to 53 V in 30 s at first, and then decreases linearly from 53 to 23 V in 3 min [8, 10]. In order to precisely control the anodization temperature the electrochemical cell, which contains the Al foil, was placed in a constant temperature water tank. All the samples were electrochemically anodized for 24 h. The remaining aluminum was etched by saturated SnCl4 solution. The samples were characterized by a field-emission scanning electron microscopy (FE-SEM, Sirion 200), and the transmission spectra was measured at room temperature by a spectrophotometer (CARY 5E) with the incident light perpendicular to the AAM DBR samples. where n1 and n2 stand for the refractive index of main and branched channel layer, respectively. To prove this, the samples prepared under different temperatures were characterized by FE-SEM as shown in Fig. 2. Figure 2a shows an FE-SEM image of the sample 1 prepared at 18 °C, and Fig. 2b corresponds to sample 2 prepared at 14 °C. It can be clearly seen that the lower the temperature was, the thinner the main and branched channel became. With the temperature decreasing to 10 °C, the main and branched channel layers turned further thinner and some branched channels began to vanish, shown in Fig. 2c. In Fig. 2d corresponding to the sample prepared at 6 °C, we can observe that due to slow growth rate at low temperature most branches disappear. As a result the morphology of the channels seems the same as that of straight ones in the ordinary AAM. The distance of remaining adjacent branched channel layers bears less than 100 nm in thickness. Figure 3shows the optical photograph of AAM DBRs prepared at different anodization temperature from 7 to 14 °C. It is clearly demonstrated that these AAM DBRs almost contain every color of the whole visible light region. where the nL and nH is the refractive index of the low and high index dielectric, respectively. Here, the branched channel layer stands for low index dielectric material and the main stem layer corresponds to the high one. The M is the number of the layer pairs. Every two neighboring layers, i.e., main channel layer and branched channel layer, constitute one layer pair. In our experiment, we could consider the air play the role of substrate with nS as 1. The refractivity R is inversely proportional to the value of nL/nH, which means the transmissivity T is directly proportional to this ratio. When the anodization temperature decreases, the branched channel layers will not grow sufficiently, so the contrast of effective refractivity of two layers turns to be less. Since the ratio of nL/nH is augmented, the transmissivity of the whole structure therewith raises. Hence, the effect of inhibition to the incident light becomes weakened. We have successfully prepared anodized alumina membrane distributed Bragg reflector using electrochemical anodization method. By modifying the anodization temperature, the transmission spectra of AAM DBR could be effectively modulated to cover almost any wavelength range of the whole visible spectrum. This work was supported by the National Natural Science Foundation of China (No.50671099, 50172048, 10374090 and 10274085), Ministry of Science and Technology of China (No.2005CB623603), and Hundred Talent Program of Chinese Academy of Sciences.